Daily Illuminator: What's New At Gen Con? July 31, 2017: What's New At Gen Con? Gen Con is almost upon us - our grandest show of the year! It's always a huge convention, but this year is Gen Con's 50th anniversary, so it's bigger than ever, and selling out fast. 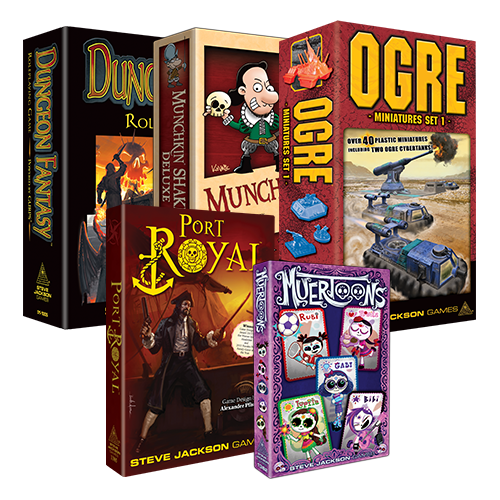 With all the hubbub, Steve Jackson Games must be bringing some pretty cool stuff to the show, right? Of course we are! Whether you're looking for early releases, sneak peeks, or just generally awesome loot, booth 1413 (and our organized-play area in Hall E) is the place for you! Port Royal drops anchor, literally, right before the convention, so we aim to have early-release copies of this push-your-luck game set in the age of piracy! Trade with merchant ships and recruit the best crew to build the biggest and best port! Copies will be limited, so make sure you get yours early. Muertoons is also getting an early start to Dia de los Muertos with some early copies at our booth. We'll also be running demos of both at the booth, if you want to try before you buy. We're celebrating the 40th anniversary of Ogre in a big way this year, with the release of Ogre Sixth Edition, Reinforcements, and more on the way, like the Ogre video game by Auroch Digital. You can catch a sneak peek at all this and more, including a preview trailer for the video game, an up-close look at Ogre Miniatures Set 1 (coming later this year), and even a free scenario, just for coming by! That's right, an entire Ogre scenario, with counters, all on one sheet, that you can take with you around the convention and play anywhere. Plus, if you want to test your mettle against fellow Ogre veterans, check out our tournaments in the organized-play area. Take home some exclusive swag, like acrylic command posts! You'll have your first chance to play the highly anticipated Dungeon Fantasy RPG at our booth! Dive in and get a feel for combat in this streamlined fantasy system. The pregenerated characters even give you a taste of the level of customization this system offers. If you have just a little time, check out our dice-game events, like Batman: The Animated Series Dice Game tournaments, for a chance to win a hard-to-find playmat. There's even a few spots left in our Zombie Dice tournaments, if brains are what you crave! I think that's it. Oh, wait - we can't leave out Munchkin! Gen Con will be the first time fans can get their stage-hands on Munchkin Shakespeare. (We'll have demos at the con, but it won't be for sale until we've delivered to our Kickstarter backers later this year.) There will be a ton of previews of upcoming sets, plus you can demo the Walgreens exclusive, Munchkin Spell Skool, and a variety of other Munchkin games. If you want a chance to win some awesome loot, like a Munchkin Messenger Bag, sign up for a tournament. And for the promo collectors, we'll have swag on hand like always. There's a whole host of fun surprises for fans who visit our Munchkin Tavern, including announcements, exclusive Tavern loot, and signings! Swing by August 17-19 for a chance to pick up a limited-edition Tavern Take-Home Box, and get your loot signed by special guests like Andrew Hackard, John Kovalic, and Steve Jackson. Plus, you get a full Munchkin-themed menu to enjoy for dinner. It's all happening at Tavern On South from 4:00 p.m. to 10:00 p.m. each night. That's a lot of stuff! We're happy to go big to help celebrate Gen Con's 50th birthday, and we invite you to join us at the party. Come out, play some games, see the previews, and get some new and exclusive loot to take home! See you at the show!